Having spent twenty-seven years Winner of the 2013 Newbery Medal and a #1 New York Times bestseller, this stirring and unforgettable novel from renowned author Katherine Applegate celebrates the transformative power of unexpected friendship. Inspired by the true story of a captive gorilla known as Ivan, this illustrated novel is told from the point of view of Ivan himself. In the tradition of timeless stories like Charlotte's Web and Stuart Little, Katherine Applegate blends humor and poignancy to create an unforgettable story of friendship, art, and hope. This paperback edition includes an author's note highlighting the differences between the fictional story and true events, a version of the author's Newbery Medal acceptance speech, Ivan's "signature," discussion questions, and more. To ask other readers questions about The One and Only Ivan, please sign up. Can I read this book ? Sunny Yes I can read this book, it's very fun and exciting too. When I read this book it's like I was in the story too!! A very touching story that will rip out your heart, stomp on it, then pick it back up and cradle it. Cause that's what Silverbacks do. I appreciate all the things KA managed to work into this book - primarily, our misunderstanding of animals (and mistreat), while showing that we aren't all bad. Also Stella's character was awesome. I'LL MISS YOU STELLAPHANT. OMG!! I finally read this book because of a book challenge and Omg!! This book is fiction but it is based on a real "IVAN". One of the sad things besides Ivan’s life is that I probably already knew all about this but forget things too easy now. One of the OMG moments is that Ivan was at Zoo Atlanta when I went there years ago!! I need to see if I can find my old pictures of him! I can’t believe I met the Ivan from the book!! This book was wonderful and sad. I love you Ivan! Sometimes I press my nose against the glass. My noseprint, like your fingerprint, is the first and last and only. The man wipes the glass and I am gone. At times like that, I wished humans could understand me the way I can understand them. It’s not so bad, I wanted to tell the little boy. With enough time, you can get used to almost anything. Please visit my blog www.readrantrockandroll.com to see this review and learn more about Ivan the gorilla. I really enjoyed this fictional story of Ivan the gorilla. The story made me think of the real Ivan and his life. What really went on in his head during those 27 years of being locked up at that dept. store? The story is cute and great for all ages. I'd recommend reading the true story about Ivan and his life before reading this fictional one. In a book called “The One and Only Ivan”, it makes sense that Ivan is at the heart of the story. Not only does his life take center stage, but he's also our one and only narrator. This book is all Ivan, all the time! In case you're having second thoughts about spending time in an ape's brain, worry not. Ivan is as articulate a narrator as they come, and a bit of a poet to boot! He recounts his life with honesty, humility, and major smarts. 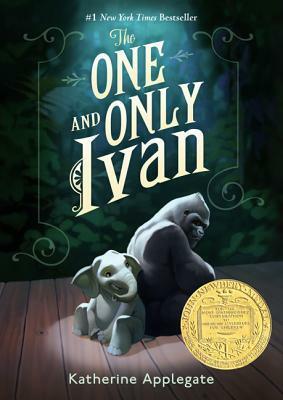 A fun fact: there really was a gorilla named Ivan who li In a book called “The One and Only Ivan”, it makes sense that Ivan is at the heart of the story. Not only does his life take center stage, but he's also our one and only narrator. This book is all Ivan, all the time! In case you're having second thoughts about spending time in an ape's brain, worry not. Ivan is as articulate a narrator as they come, and a bit of a poet to boot! He recounts his life with honesty, humility, and major smarts. A fun fact: there really was a gorilla named Ivan who lived in a mall for a long time after being captured. At a certain point, he actually did move to the zoo where he spent the rest of his days. Real life Ivan’s story matches up with our Ivan’s story, but Katherine Applegate wove her magic in telling the story in the first gorilla (I just can’t help it!) POV and personified Ivan with an entire range of human thoughts, feelings and emotions. In the entirety of the book, Ivan is always on display but it's not a one-way street. Ivan watches all the people watching him, and his observations about humans are among my greatest delights in the book. It's a lonely life, but he does have a few loyal friends, including a highly opinionated dog, an aging elephant and, eventually, a baby elephant named Ruby who sets his life on an entirely new course. It is clear that Applegate has written the book for a younger audience, but I think even adults would appreciate it. Some of the growing up elements in it, particularly in Ruby and Ivan's journeys, are appealing because they explore issues of youth, maturity, and overcoming our past, which is something each and every one of us has to do in some way, at some point. The book also takes a good hard look at the human practice of capturing wild animals, digging deep into what this means for, well, the animals. What emerges is a clear sense that animals matter--you know, just like we do! “The One and Only Ivan” doesn't come right out and say that animals can't ever have happy lives in captivity. What it does say though, is that how we treat the animals we keep in captivity really matters. They might not be people, but that doesn't mean they don't deserve comfort and consideration. I bet everyone who has spent time with Ivan strongly agrees. I not only read this wonderful children’s book... but the facts about the true story. Damn... if this story didn’t make me cry!! Sometimes, life just pisses me off ... the selfish stupid insane things they do! My anger and sadness buttons were pushed from the true story. children’s ears. There is still sadness- but handled with tenderness. The illustrations compliment the story - wonderful! I’m not going to share more other than to say ... we all know animals never belong locked up in a mall. probably the late banana-peel to party), — love animals at all —take the time to read it. Mr. Hankins is putting his readers on THE ONE AND ONLY IVAN for the beginning of 2012's reading season. Think of all of the good stuff you loved about THE ART OF RACING IN THE RAIN and TUESDAYS WITH MORRIE and, instead of sitting with Enzo in a cozy living room watching the discovery channel or with Morrie in a study littered with books and notes, you'll be sitting in a cage with Ivan, "the Ape at Exit 8," a thoughtful gorilla tasked with one of the most difficult callings ever. . .caring for a Mr. Hankins is putting his readers on THE ONE AND ONLY IVAN for the beginning of 2012's reading season. Think of all of the good stuff you loved about THE ART OF RACING IN THE RAIN and TUESDAYS WITH MORRIE and, instead of sitting with Enzo in a cozy living room watching the discovery channel or with Morrie in a study littered with books and notes, you'll be sitting in a cage with Ivan, "the Ape at Exit 8," a thoughtful gorilla tasked with one of the most difficult callings ever. . .caring for a new cast member in a broken down circus, a baby elephant. Appelgate's prose is beautiful, and Ivan, her narrator, like Enzo, gets to saying some things about being "human" that we all need to hear. . .a lovely, lovely book that will prompt discussions about what it means to live within one's intended calling even when that calling is not made manifest in the day-to-day doings. The book could also foster conversations about what it means to dig deep for that one latent gift that is just waiting for us to tap into it for the greater good--not only of ourselves, but for those around us. Just when I think I'm too old, too mature, too hard-hearted, too sophisticated, too busy, or too "something" to allow a children's book to make me cry, along comes a story like this one. Don't have enough of the right words to describe it...I definitely haven't mastered the craft of writing the way Ms. Applegate has. And the way she does it, with the sparest of prose, is impressive. To me, "good" writing makes the reader view something with a fresh perspective, as if (s)he has never, ever experie Just when I think I'm too old, too mature, too hard-hearted, too sophisticated, too busy, or too "something" to allow a children's book to make me cry, along comes a story like this one. To me, "good" writing makes the reader view something with a fresh perspective, as if (s)he has never, ever experienced it before. Or, as if (s)he is suddenly living inside another's body, thinking thoughts that only the character could think, seeing the world as only that character would. So, for the past couple of hours, I have lived life as a captive silverback gorilla in a filthy roadside circus. It was...poignant. Who knew. Never thought about being a gorilla before. "Everyone has parents," Bob explains. "It's unavoidable." I started out this review with a funny quote - but this is NOT a funny book. It's one of those emotionally manipulative sad books about animals. A seven-year-old girl personally recommended this to me. Little kids LOVE emotionally manipulative sad books about animals. Charlotte's Web, Black Beauty, Old Yeller, Shiloh, Where the Red Fern Grows, The Cat Who Went to Heaven etc. etc. You can add this book to the list. This is based (loosely) on "Everyone has parents," Bob explains. "It's unavoidable." This is based (loosely) on a true story. Ivan is a gorilla who is kidnapped along with his sister in Africa when he was a baby. His parents were murdered. Both he and his sister were shipped to the U.S., but his sister died in transit. Now Ivan lives in a cage in the mall, eking out his solitary and depressing existence. But at least he has company. An old wise elephant named Stella, who was bought from a circus, and a stray chihuahua-mix called Bob, who is "homeless by choice" but sleeps on Ivan's expansive stomach every night. And even though you may be surprised, Ivan has a human friend, too - Julia, a 10 or 11-year-old who is the daughter of the night janitor. She sneaks Ivan drawing supplies - he is a proud artist, and loves creating pictures that are framed and sold in the gift shop for $25. If you are sensitive to animal cruelty, do NOT read this book unless you want to cry. The book has a (relatively) happy ending, but tons of bad things happen along the way - to gorillas, elephants, and dogs. I liked the book, I think it was well-written and perfect for children. Of course, as an adult you are going to have more of a critical eye - some parts really stretch credibility, the author is blatantly tearjerking you - but none of this will even occur to a child reader. The book is, of course, doing good work by helping children sympathize with animals and raising awareness about animal cruelty and human responsibility to treat animals with compassion. The book is saved from being a total sapfest mainly because Bob the dog is funny sometimes. The book has little illustrations occasionally. This book is very reminiscent of Charlotte's Web in more than one way. That's not a criticism, exactly, but you'd have to be blind not to notice the glaring similarities. That being said, Ivan stands on it's own two feet, I didn't feel like the author was using White as a crutch. Another thing that is good is the book's treatment of "villains." The "villain" in this book (barring the unseen and unheard humans of the past who slaughtered elephants, gorillas, and dogs respectively) would be the mall's owner, Mack. Especially when he takes to (view spoiler)[using a claw stick on Ruby the baby elephant in order to train her and teach her to comply. (hide spoiler)] But the book is careful to even out Mack's personality. He's not some sinister evil man who wakes up every day longing to cause animals pain. Instead, we see that he is tired, poor, depressed, and struggling to keep his mall in business. He even (view spoiler)[looks at some pictures of him and Ivan together when Ivan was a baby and Ivan lived in his house for years. He seems to like Ivan, even though he doesn't always make the best decisions for Ivan's happiness or wellbeing. (hide spoiler)] I feel like this is a very good thing. As much as I can "love to hate" cackling villains like Count Olaf and Jiggy Nye, it's refreshing to see a more human and adult face on a villain once in a while. I came across this when I was checking out last year about the upcoming Disney movies. Based on the synopsis, it was based on the award-winning children's book written by Katherine Applegate and famous actors will be the voice of the characters in the story. I scheduled to read this on the very first day of 2019 and I was really delighted that I made this my first read of the year. I didn't expect that this was quite good and hopefully the movie adaptation will be as great just like the book. I I came across this when I was checking out last year about the upcoming Disney movies. Based on the synopsis, it was based on the award-winning children's book written by Katherine Applegate and famous actors will be the voice of the characters in the story. I scheduled to read this on the very first day of 2019 and I was really delighted that I made this my first read of the year. I didn't expect that this was quite good and hopefully the movie adaptation will be as great just like the book. I know that Ivan's story will make an impact on anyone who will either read this or those who will go watch the film because of how heartwarming and it is an eye-opener to wildlife animal preservation. ::sniff:: What's that in my eye, this watery, salty substance? Crying? No. I'm not crying. I'm too old and cynical to cry. My tear ducts have long dried up. Really. Oh for godsake, will someone hand me a tissue! Este fue el último libro que leí en marzo, pero decidí esperar unos días para no escribir la reseña en "caliente". Esta es una novela sobrecogedora, esperanzadora pero muy cruel. Desde la voz de Iván, este gorila inteligente y luchador, encontramos nuevamente a la humanidad en su mejor y peor versión. Las contradicciones del ser humano cuando la palabra humanidad le queda grande, son muchas y muy difíciles de reconocer. Una novela para reflexionar sobre quién es realmente la bestia no pensante: l Este fue el último libro que leí en marzo, pero decidí esperar unos días para no escribir la reseña en "caliente". Los animales viven, nosotros invadimos. Y la voz de un gorila macho que se extingue sólo nos recuerda lo tóxica que es nuestra especie, incluso con nuestros primos lejanos. Pd: lloré con una frase de este libro. Con una simple frase. No olviden que la historia de Iván está basada en hechos reales. Una historia muy conmovedora, con unos personajes que se ganan tu corazón y una enseñanza muy bonita. Una lectura ligera, fácil y rápida. Me ha gustado bastante la historia de Iván. Touching. This is about possibility and about the will. Having the will to help someone else, going into yourself and letting your intuition and higher self find a way to keep a promise and help someone that is helpless. Such big themes in this story and such big ideas. I think this could be a book a spiritual group does a study on. Great stuff in this book. Ivan is a silverback gorilla that is held in a side show with only a few animals. His best friend is a dog, Bob, and an elephant Stella. A y Touching. This is about possibility and about the will. Having the will to help someone else, going into yourself and letting your intuition and higher self find a way to keep a promise and help someone that is helpless. Such big themes in this story and such big ideas. I think this could be a book a spiritual group does a study on. Great stuff in this book. 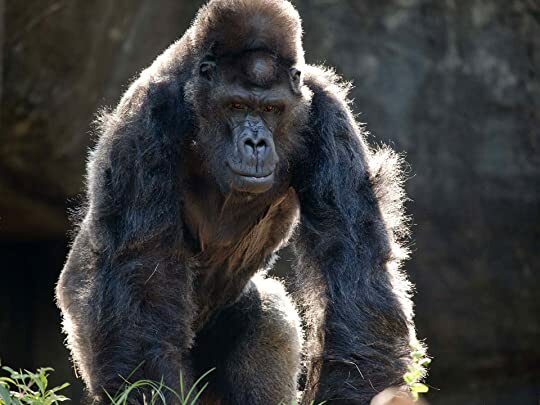 Ivan is a silverback gorilla that is held in a side show with only a few animals. His best friend is a dog, Bob, and an elephant Stella. A young elephant, Ruby, is brought into the mix. Stella wants to save the pain of captivity for Ruby and wants to send her to the Zoo. Also, Ivan is an artist and he enjoys painting, eating the paint and paper and painting some more. Art is a spiritual connection in this story. Art gives Ivan a voice and he also helps keep the place afloat as the owner sells his paintings. What I love about the story is Ivan's voice. It is totally believable that this is the voice and thought of a gorilla. It's spot on perfection. Stella's voice is great and Bob is hilarious. I love Bob. I thought that someone was actually reading sign language from a gorilla and relating the story for us at first it was so convincing. I have seen a special on TV where they taught a gorilla sign language and the communication was amazing. They would ask the gorilla complex questions that required reasoning and the gorilla gave some great and insightful answer. They told her about global warming and the gorilla was very sad about this and couldn't understand why people would continue to hurt the world. It was great and it reminded me of Ivan's voice. There is pain and the animals tell their stories of being afraid and captured. It's about the lose of freedom and hope. There is death and there is wonder in this story. Edit: My friend Matt recently wrote a review for this book and it's shorter and much nicer than mine so you should read his instead of mine. Matt's review is here. So my childhood came for a visit last weekend. By that, I mean this book came into my life last weekend. Big fonts and equally majestic illustrations reminded me of being a kid again. Yet, this book goes beyond a children's book. Everyone should read it because it conveys a story many other books lack. I, of course, expected nothing les Edit: My friend Matt recently wrote a review for this book and it's shorter and much nicer than mine so you should read his instead of mine. Matt's review is here. I, of course, expected nothing less from K. A. Applegate. She is the co-author of Animorphs and married to author Michael Grant? I think that is a deadly combination. "Anger is precious. A silverback uses anger to maintain order and warns his troop of danger. When my father beats his chest, it was to say, Beware, listen, I am in charge. I am angry to protect you, because that is what I was born to do." Here is my domain, there is no one to protect." There were many passages like this throughout the book that made me felt an assortment of emotions. I felt Ivan's sadness and loneliness. His isolation from his kind and the naivety his human caretakers his given him. This book is a MUST READ for the old, young, young-at-heart, happy, sad, emotionless, and everyone in between. I cannot begin to put into words how I feel about this book. The above was an attempt but I think I did a pretty crappy job. Just read it, guys. P.S. : I love how there was a character named Stella in there. :') Bravo, Ms. Applegate. This award-winning middle grade story is based in truth. The structure is different with it's very short chapters/thoughts each presented with a heading/title. This fascinating approach lends a believable voice to our wise gorilla narrator, who speaks simply but understands deeply. The structure, however, did not make for a great listening experience. Long pauses between each "chapter" coupled with the many "chapter titles" made for an odd and disjointed listening experience. Though the reader v This award-winning middle grade story is based in truth. The structure is different with it's very short chapters/thoughts each presented with a heading/title. This fascinating approach lends a believable voice to our wise gorilla narrator, who speaks simply but understands deeply. The structure, however, did not make for a great listening experience. Long pauses between each "chapter" coupled with the many "chapter titles" made for an odd and disjointed listening experience. Though the reader voiced all the characters quite well, this is one the seems unsuited for audio. This is a great book about wild animals being forced to live in bad conditions by ignorant humans. Ivan is based on a real Gorilla, and the fictional story Applegate wove pulled a bit on my heartstrings. I love Stella. It's a very, very sweet story. I can definitely see why people love this one so much! I borrowed the audiobook from my library using an app, but then I found out there was illustrastions and felt like I was missing out. There are some prime examples if you google for them though, This is a great book about wild animals being forced to live in bad conditions by ignorant humans. Ivan is based on a real Gorilla, and the fictional story Applegate wove pulled a bit on my heartstrings. I love Stella. It's a very, very sweet story. I can definitely see why people love this one so much! All right, the topic is Famous Ape Books of Children's Literature. And . . . go. Care to name any? Well there's Curious George, of course (often mistakenly called a monkey in spite of his lack of tail). He's the most famous but after that it gets harder. Eva by Peter Dickinson might count (also a chimp). Or a book like Hurt Go Happy by Ginny Rorby (chimp). Gorillas appear to be much rarer, which is funny when you consider it. I would think an animal as big and impressive as a gorilla would be a All right, the topic is Famous Ape Books of Children's Literature. And . . . go. Care to name any? Well there's Curious George, of course (often mistakenly called a monkey in spite of his lack of tail). He's the most famous but after that it gets harder. Eva by Peter Dickinson might count (also a chimp). Or a book like Hurt Go Happy by Ginny Rorby (chimp). Gorillas appear to be much rarer, which is funny when you consider it. I would think an animal as big and impressive as a gorilla would be a no brainer children's book hero. As it happens, Ivan of The One and Only Ivan is a rarity, and not just because his story covers ground that few other books have (with the exception of the odd Good Night Gorilla). Katherine Applegate's title is a cry for animal rights that works on its reader in slow subtle steps. You will find no screeds or speeches or long lengthy lamentations. Instead, it's just a gorilla living what life he can, until the day he can stay silent no longer. Thanks to its restraint the book ends up being a gem. One of the best of the year, no doubt. Basically what we have here is Charlotte's Web if you took that tiny spider and replaced her with a 300-pound gorilla. Which, to be frank, would normally bode badly for said gorilla. And certainly badly is how Ivan, the titular hero of this tale, bodes when you consider that he is trapped in an off-highway mall circus. Ivan's never questioned his fate seriously, considering that he's been there for twenty-seven years. Then one day Mack, the owner of the mall, decides that the only way to drum up more business will be to buy a new resident. There's already Ivan and Stella, the elephant with an injured foot that doesn't seem to be getting better. To this mix comes Ruby, a baby elephant not long captured from her home in the wild. Thanks to Ruby, Ivan sees that this is no place for a baby of any sort and he must use all his brains and intelligence to find a way to save not just her but himself as well. It is the temptation of every author, bad or good, to simplify ethics when they write for kids. Bad guys are bad, good guys are good, and never the twain shall meet. This is particularly true of animal abuse stories. After all, who wants to go about digging up a heart of gold in a character that kicks puppies? Yet the best books for kids are often the ones that allow for at least a glimpse of the human inside the villain. It's the reason Phyllis Reynolds Naylor's Shiloh works as well as it does and it's one of the reasons why The One and Only Ivan distinguishes itself. Mack is the villain here, no question about it. You don't go about hitting baby elephants with sharp objects without it rubbing off on your character, so to speak. But there are depths to Mack as well. He's a man who really did love Ivan on some level when the gorilla was a baby. Then his wife left him and he started hitting the booze to deal with his financial problems. There are a lot of Macks in this world and I think it's worth letting a kid know that they can feel sorry for someone but still hold them accountable for their actions. No matter how bad you feel for the guy, Applegate never lets you forget that he's the reason for Ivan, Thelma, and Ruby's imprisonment. I don't think Applegate could have gotten very far in this novel if she hadn't gotten Ivan's voice right from page one onwards. I got hooked pretty early on when in describing his situation Ivan says simply, "At present, I do not have any gorilla friends." The temptation to anthropomorphize must have been great. We can't ever really know what a gorilla is thinking at a given time, but Applegate plays nicely with the differences between what we think and what he thinks. Ivan isn't stupid by gorilla means but kids might find his thought process a bit slow from the human standpoint. That's okay. He comes to thoughts and ideas in his own time. Plus the pacing of those thoughts and ideas works well. I'm a sucker for a good emotional beat. Ivan has to grow and change in the course of this novel, even if he's physically trapped. So Applegate parcels out his growth incrementally but quickly enough that the child reader doesn't get bored. There are worlds worth of meaning loaded in the way Ivan eventually changes from referring to his home as his "domain" to his "cage". Worlds. Generally speaking, when a book is written as a verse novel I like there to be a reason for it. For example, Thanhha Lai's Inside Out and Back Again uses its verse as a way of considering the transition from one culture and language to another. When I encountered verse in The One and Only Ivan I initially dismissed it as yet another easy authorial trope. Thinking about it, though, I've come to the realization that verse works well here probably because Ivan is not a human. His thoughts are vast and complex but restrained (by choice, to a certain extent, and by nature itself). Applegate also takes great care in how she uses language. Her descriptions can be delicious. A seal has a "voice like the throaty bark of a dog chained outside on a cold night." "Humans always smell odd when change is in the air. Like rotten meat with a hint of papaya." "Human babies are an ugly lot. But their eyes are like our babies' eyes. Too big for their faces, and for the world." And a mop, "moves across the empty food court like a giant brush, painting a picture no one will ever see." The violence when it comes is well done. You're not even entirely certain anything has actually been done to the baby elephant, but the claw-stick is always there like an unspoken threat. Physical violence in this book doesn't really occur. It's the psychological kind that's more common. Keeping wild animals in tiny penned concrete cages is something children can understand. They too are kept in enclosed areas, sometimes against their will. And even they can comprehend what it would do to someone to only know the walls around you. Why doesn't Ivan fight back? He does. He just needs someone to protect first. The illustrations pose a bit of a puzzle, though. They're not bad by any means. Just . . . off. A friend of mine likened them to the cover of The Underneath by Kathi Appelt. To her mind the image of a dog and kittens gives Appelt's novel a misleading sunshine and rainbows feel where instead you find a book of gritty magical realism (new genre). I didn't really see it with Appelt's book but I definitely felt that way about the pictures in Ivan. Though I wouldn't label Applegate's book as bleak or morose, there is a seriousness to it. We're dealing with the subject of abuse, mental and physical to a certain extent. Yet looking at the cover I see a gorilla and an adorable baby elephant hanging out together. Inside it's the same. Artist Patricia Castelao's pictures are well made but they evoke a sweeter simpler novel that what we have in our hands here. I suspect that may have been the point, though. You can counter darker written material with sweet images. I just don't think this is quite the ideal pairing of the two. I had a moment of confusion and doubt early on in the book around page 166 when I wondered if the book was defending zoos. Ivan tells Ruby that zoos are where "humans make amends." It would make for a good book group discussion point: Does the author think zoos are a good thing or a bad thing? Be sure to bring up the fact that Ivan sees the inside of a zoo at one point and comments, "It's not a perfect place . . . A perfect place would not need walls. But it's the place I need." Well this is the book we need. Consider it an animal book for those kids who don't like animal books. There's nothing twee or precious about it. Just good crisp writing, complex characters, and a story that will make animal rights activists out of the most lethargic of readers. Applegate has penned a real doozy of a book that speaks to the best and worst in all of us. Ivan was a baby gorilla when he was adopted by Mack, a mall owner. All his life he grew up inside a glass cage and all his needs were taken care of by Mack and the animals-keeper, George. Ivan has no idea about the life outside that mall. He is accompanied by a dig named, Bob, some birds and an elephant named Stella. All these animals have a strong bond of friendship and understanding. Stella is the oldest among the lot and shares stories about the world outside with Ivan. Now Ivan has a lots of qualities of his own, he can paint, which is later sold at the gift store in the mall, he loves watching TV and is a big fan of Western movies and also loves watching humans passing by his glass cage every day. But his life is not all too glorious, he longs to be free and wants to be free among his kind. So when a baby white elephant named Ruby joins the lot, Ivan thinks otherwise and begins a mission on his own to free himself as well as Ruby from that mall. Honestly, I've read anything so touching as well as thoroughly enlightening. The author did a great job in capturing the voice of the animals, especially Ivan, through this story and thus making the readers feel connected with him. The author's writing is emphatic and is layered perfectly with humor and sadness. The plot, though a real-life inspired story, moves with a fast pace as Ivan notes down his observations about his life and that of humans around him. The narrative style is crisp and engaging and is easy for the kids to read with short, clear sentences and especially written with an easy to understand English, meaning there is no flowery words. The characters here are mostly animals and the author has captured their honest voice and thoughts thus bringing them to life. Ivan is the most adorable character of the book and I bet it will be difficult for the readers to let him go after the end of this story. Ivan's opinion about human are bound to make the readers take a pause and think for a while about their attitude towards animals and how we treat them. Ivan is funny, laid-back, and quite intelligent gorilla who is smart enough to chalk out an escape plan for himself as well as for the fellow elephant. Ivan's story is not only an eye-opener, but also thoroughly painful, especially when he narrates about his every day life in that glass cage. Ruby and Bob are two other fascinating whose voice are also captured strikingly by the author. There are also some human characters some who treat these animals with love and care, like Julia and George, and some who only think them as a means to earn more money, like Mack. That's an honest revelation about human nature. The story of Ivan is a must read for every other human being and this book can be a great learning tool for young kids. In a nutshell, this story is captivating, heart-breaking as well as funny with a lesson to learn. And I return back to this story again and again. The emotions that are depicted through the narration are honest, straight from the core of the heart and are heart-felt with a power to make the readers sync with those emotions. Verdict: The book has already won so many literary awards, so you don't need me telling you that this is a must-read book. Chicken soup for the soul. The Grinch himself would be hard-pressed not to empathise with Ivan's story. With a gorgeous cover and a heartbreaking memoir of a lonely, caged gorilla living among other mistreated "circus" animals, delivered via emotionally-charged and insightful writing, Ms. Applegate forced tears from this stoic, 25-year-old pessimist. By reading The One and Only Ivan we walk a few miles in Ivan's shoes, so to speak. His wistful words touch your heart. His friend, Stella the elephant, twists your soul with her story and sentiments. Ruby, the baby elephant, you're desperate to save from Stella's fate. My arms ached with wanting to hug these (obviously wild and dangerous) creatures. 'Every night, when the stores close and the moon washes the world with milky light, Stella and I talk. We don't have much in common, but we have enough. We are huge and alone, and we both love yogurt raisins. The graceful language is simple and concise yet colourfully illuminating. No words are wasted. The author implies rather than tells, allowing readers to draw our own conclusions. The lovely illustrations are sparse but functional. I knew early on this would be a five star re-read. Ivan's philisophical observations, his acceptance of his circumstances, his stubborn desire to never remember his wild and free childhood before he was captured, his all-consuming, engrossing characterisation, and the way he changes to become the silverback he's always wanted to be, like his father, when he meets Ruby -make this a page-turner. At page 72, my heart clenched and my eyes misted over with the introduction of baby Ruby, her distress and Stella's comfort...I'm tearing up just thinking about it. Ruby's a curious innocent you want to protect, and Ivan and Stella do their best. This story is loosely based on a real gorilla called Ivan, and other elements of it are real too. I've come away thinking the human race are scum that should be exterminated to allow all animals to live natural, peaceful lives without fear of human murderers and torturers. Me, the meat-eating non-pacifist. I suddenly feel the need to contribute to an animal welfare charity. That's probably the message working its magic on me. I highly recommend this captivating book to everyone over the age of 12, because the beginning is full of the depressing reality of cruelty to animals despite the sweet and somewhat predictable happy-ever-after ending. Even those with hearts made of ice can't fail to melt whilst reading this. I wanted to read a short and sweet story today. Some fluff. What I didn't realize was that this book isn't fluff. It's heartbreaking and cruel and true and one of the most important stories for children (and adults) I've ever read. The story is about Ivan, a silverback gorilla who lives in a mall. The book is based on a real gorilla who was locked up in a cage of a Washington mall for 27 years before public awareness finally grew and people demanded that he be brought to a zoo (in Atlanta) at lea I wanted to read a short and sweet story today. Some fluff. What I didn't realize was that this book isn't fluff. It's heartbreaking and cruel and true and one of the most important stories for children (and adults) I've ever read. The story is about Ivan, a silverback gorilla who lives in a mall. The book is based on a real gorilla who was locked up in a cage of a Washington mall for 27 years before public awareness finally grew and people demanded that he be brought to a zoo (in Atlanta) at least. So this story is about Ivan and a few other animals who live in a mall and how they spend their day-to-day lives. It's also about what captivity means to animals. We get the comparison to zoos (who still are far from perfect but definitely better) and circus and get a glimpse at how animals usually are captured. In the wake of what happened to the poor gorilla in Cincinnati Zoo when a baby fell into the enclosure, one story within this book strikes especially hard. First, I don't belief for a second that any animal is dumb. Secondly, I firmly believe that animals have great emotional intelligence and usually don't harm babies of any kind. It's how/why a tigress raised piglets for example. Therefore, I don't think the baby in Cincinnati was ever in real danger - if the adults around the enclose had kept their mouths shut instead of panicking, the gorilla would have never gotten nervous in the first place and in my opinion he simply wanted to protect the baby. But they had to shoot him. That's humans for you.